All transactions are safe and secure with a reliable history in online purchasing behind each of our associates. 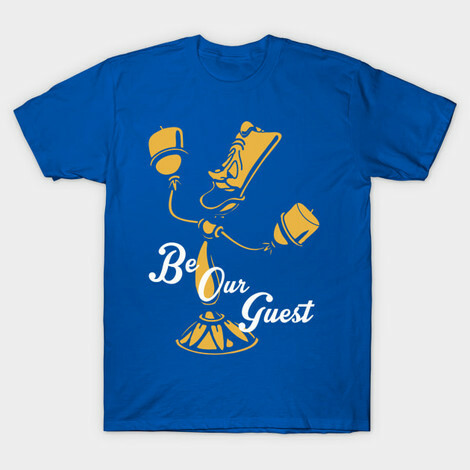 Buy the Be Our Guest Lumière T-Shirt to own Beauty and the Beast clothing and merchandise. This Be Our Guest shirt will have you humming the catchy song that Lumière sings in the Disney movies. Belle sits down for dinner at the castle's giant table and Lumière, Cogsworth, Mrs. Potts, Chip, and the other enchanted household objects dance around as they serenade Belle with song and food. In addition to the Be Our Guest Lumière T-Shirt above, browse the Beauty and the Beast Clothing Gallery for more apparel like men's and women's clothes, kids shirts or hoodies.